On paper, the case for (dare one say ‘celebrating’) Basant is an absolutely convincing one for a number of reasons. So, take a Gallop poll. Check out an e-mail opinion survey on a television channel. Even call in Human Rights Watch and Transparency International if you want. Go for a UN sponsored investigation, if not a referendum or a plebiscite. Only one outcome is certain, that the majority of the people of Lahore of all ages, from all classes, and belonging to all walks of life will give a resounding ‘yes’ to restoring the city’s much -beloved but since lost annual kite-flying festival. The main reasons why the festivity (again one uses the word with foreboding) should be urgently revived (with certain safeguards and precautionary and regulatory measures) are financial, social, cultural and psychological. Starting with the last mentioned, the citizens of the city, tormented by woes and horrors too numerous to recount here, but known to all, badly need a break from these stresses and cares, from this ‘endured but unendurable pain’. What easier way for the authorities to provide much needed relief to the people in the short term than by reviving the popular common pastime and family affair for two days this month? Depression, frustration, anxiety, repressed anger and badly frayed nerves badly need a healing touch, an outlet. In these grim times of increasing poverty, rampant inflation and widespread unemployment, millions of lives hang in the balance, while the government faces a financial crunch. Overall, the festival of Basant was an economic bonanza, generating billions of rupees and providing gainful employment to hundreds of thousands of people, mostly from the down-trodden and backward sections of society. Some of the latter were in the business for decades. A few kite-makers were superb craftsmen and artistic designers in their own right, blending colours and shapes with creativity and flair, and enlivening the skies of Lahore with a frenzy of colour. Their kites once soared with the agility of fifth generation fighter aircraft, captivating and uplifting the hearts of locals and tourists alike. The desolate expanse of sky in the absence of the traditional sport, with the only kites around being of the animal kingdom, is a testament both to the labours of these craftsmen and a lament to the glory that once was. Now the thousands of families once connected with the business are living in penury, with no end in sight to their miserable plight. 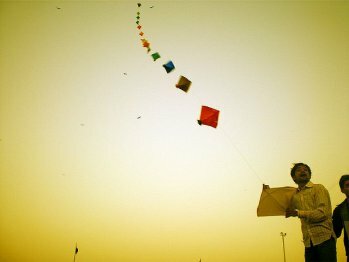 Socially, Basant day provided an ideal opportunity for families and friends to get together, and to enjoy the kite-flying and the unique ambience as well as the delicious food cooked for the special occasion. There was much hilarity, joy and bonhomie. Basant was the great leveler or equalizer of class distinctions. Such was its mass appeal that high and low co-mingled without pretensions in the pastime, who otherwise would not be seen dead, socially. Culturally, Lahore has shed much of its charm over the preceding decades. The heritage of a thousand years of tumultuous history, in terms of value-systems, traditions, events and architecture, has gradually been eroded by commercialism. Lahore has lost its claim as a seat of leaning, its arts, its wit, its unrivalled food, and also lost its temper (despite having only one, as Oscar Wilde would have remarked!). To the despair of millions, it has also parted company with its annual festival of kite-flying, Basant, which had catapulted a local pastime to worldwide recognition in a relatively short time. But, as in any sport, unforeseen problems have arisen, with tragic consequences. These demand resolution by sensible regulation and strict implementation, before the event can be deemed safe again. The solution involves certain immediate (or precautionary) as well as long-term (or regulatory) measures. In the case Basant is permitted for a weekend this year, the time constraint and other factors allow for basic precautionary safeguards only. Essentially, these entail a complete ban on motorcycle driving from Saturday evening to around dusk on Sunday next. If genuinely adhered to, the gory incidents of the past would hopefully be avoided. However, if some brave hearts or reckless spirits (‘stupidity is the biggest sin’) ignore this restriction or confining schedule, an antenna or aerial fixed on the bike is an absolute must before venturing out, in order to avert any untoward incident. This cheap and simple device, a familiar sight on motorcycles in Lahore last basant, is an effective counter to the stray twine that entangles the motorcyclists and causes the gruesome accidents. But most importantly, children and infants should emphatically never, repeat never, be seated on the front of the bikes while traveling on these two days of Basant. And, corporate entities, please scrupulously avoid song and dance parties on the hired rooftops of the walled city. Leave it at the food and drink. A self-appointed stern puritanical strain, of which the less said the better (and safer!) overshadows every activity and event in our lives. And as someone said of the ban on bear-baiting in England, ‘the puritans banned bear-baiting not because it gave pain to the bear, but because it gave pleasure to the spectators’. However, there is one big overwhelming problem and that is the considerable quantities of dangerous thread and outsized kites in private hands as well as with vendors, left over from previous years before the ban on kite flying. These are sure to be used at the first opportunity, till their stocks are dissipated. They pose the greatest danger to a safe Basant. However, with the precautionary steps mentioned above, the chances of accidents would be greatly reduced. But prayers and crossed fingers would still be required. The detailed long-term measures (which basically start with reducing the legal size of the kites and the thickness of the thread) for the future need to be sorted out with all the stakeholders, including the thread manufacturers, the kite and ‘dor’ makers, the shopkeepers, the kite-flyers represented by the Kite Flying Association, the City District Government Lahore (CDGL), and last, but not least, the media. The setting up of a permanent basant cell in the CDGL (town-wise) as a liaison and monitoring mechanism with co-opted members from all those concerned with the sport is essential. It can also lay down a code of conduct and supervise its implementation. Banning everything right, left and centre is not the answer. The blame-game does not offer a lasting solution. Allowing a well-regulated and safe Basant through serious concerted efforts – and it can be done – is to restore a semblance of normalcy to the embattled citizens and to bring a bit of the lost art of laughter into their lives. open the Basant Festival … hamara shoq…. hum kb tk basant miss karen ge?